Inspired by the Khmer Rouge-era story he heard from a Cambodian friend in 2008, an American writer is now trying to translate that experience for theatergoers in California. 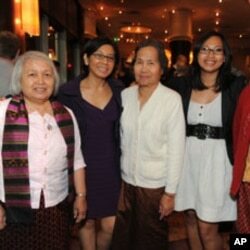 Cambodian survivors at the opening night of "Extraordinary Chambers". Named after the official moniker of the UN-backed Khmer Rouge tribunal, the Extraordinary Chambers in the Courts of Cambodia, the play also looks at Western involvement in “controversies” surrounding the court, he said. The play tells the story of an American businessman, Carter Dean, who travels to Phnom Penh with his wife and becomes more and more involved in Cambodian intrigue and the ghosts of its past. “I want to think that the characters of the play have experiences that show the extraordinariness of their own hearts,” Wiener told VOA Khmer in an interview last week, following opening of his show in Los Angeles. As the story moves along, Dean and his wife meet a Cambodian child they hope to adopt. But along the way, they are continually faced with the problems of modern Cambodia—and some memorable villains. The story was inspired by Wiener’s own experience in Cambodia, where he befriended a tour guide in 2008 and heard the man’s story under the Khmer Rouge. “I was so moved by what he and his family experienced, and amazed that he, a former high school physics teacher, had survived what was a dangerous time for people,” Wiener said. Francois Chau in the world premiere of David Wiener's Extraordinary Chambers at the Geffen Playhouse. “Extraordinary Chambers” includes a villain role played by Cambodian-American actor Francois Chau. The play’s managing director, Ken Novice, said it was important for an American audience to better understand the tragedy of the Khmer Rouge. “What happened in Cambodian, what happened in Nazi Germany, what happened in various place around the world, we know continues to happen,” he said.